Recently, ingredients in perfumes and scents have come under some scrutiny and French fragrance houses are already re-thinking what goes into their famous name fragrances. The impact of ingredients on people and the environment are forging a new sector in the fragrance industry. 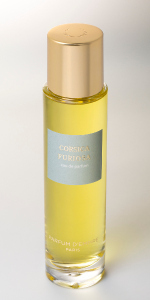 Released earlier this year, Corsica Furiosa was the first new launch from Parfum d’Empire since 2012’s Musc Tonkin. Perfumer Marc-Antoine Corticchiato has based the fragrance on an overdose of the natural material, lentisque (or mastic resin), using it in the form of oil, absolute and extract. The resin is obtained from an evergreen shrub, Pistacia lentiscus, which is native to Corticchiato’s picturesque homeland, the Mediterranean island of Corsica. Notes for Corsica Furiosa include lentiscus (mastic) oil, nepita (a local variety of wild mint), lentiscus absolute, tomato leaf, pepper, lentiscus extract, hay, honey, cistus and oakmoss. As you may have already noticed, the line has redesigned its bottles and packaging. The top of Corsica Furiosa features tomato leaf with a dash of lemon and a few sprigs of mint. The lentisque quickly kicks in full force and the fragrance remains linear for several hours. It’s tart and crisp, accented with a sprinkling of pepper. Lentisque (and therefore Corsica Furiosa) is the scent of bright green, fibrous plant stalks rather than dark green, lush vegetation. It’s more sturdy than tender. I can imagine the bosky bushes in Corsica growing on dusty slopes under a hot sun. “Furioso” is a musical term. It’s a direction, instructing a piece “to be played rapidly and with passion”. Corsica Furiosa is certainly invigorating in its verdancy. It’s a vivid green at high pitch. Enlivening and intense, it captures the mood of an energetic walk up a hillside in the Mediterranean, with clean air and wide open vistas.